The purpose of this article is to present design rule tips on Tallguide layout design. Like rigid waveguide, Tallguide runs need to be laid-out between the transmitter starting point and the antenna. Often the Tallguide end location is an antenna feed assembly or azimuth or elevation rotary joint. Since the transmitter control room angular orientation and elevation may differ from the antenna and may have several hundred feet separation, computer aided drafting programs are one method of keeping track of the layout features. Of course, back-of-the envelope sketch drawings serve the same function. 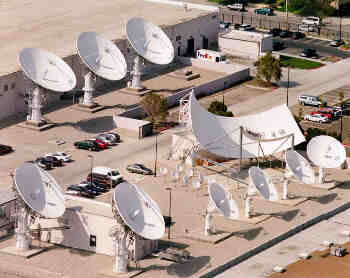 DBS DirecTV broadcast site, California, using 9m and 11m antennas. Tallguide TG87 is used on each antenna uplink. Every Tallguide run begins with and ends with a Tallguide transition from standard WR waveguide into or out of Tallguide. Transitions come in two models: -1 or –2. When –1 is added to the Tallguide transition model number, the designation refers to a WR waveguide input flange that is a flat cover flange. In contrast, the –2 designation refers to a WR waveguide pressure gasket grooved flange. For example, part number 181-1078-1 refers to a TG115 transition with a mating WR75 flat cover flange. Every Tallguide run contains one mode suppressor located between the input and output transitions. Mode suppressors are reciprocal devices. Either end may be used as input or output. For high power Tallguide runs, the mode suppressor is located on the output (antenna) side of the run just before the output transition. Low power is defined as 1/10 the maximum Tallguide power rating. High power is everything else. A Tallguide H-plane bend is a bend in the broad wall. There is no change in polarization direction. AFC fabricates special H-plane bend angles for customers all the time. Contact AFC's sales department to inquire about your unique bend angle. A twist changes polarization direction. For example a 90-degree twist changes vertical polarization into horizontal polarization. There are no direct methods of fabricating a Tallguide E-plane bend (a bend in the narrow wall) and keeping transmission loss low. To create a Tallguide E-plane bend substitute, a Tallguide E-plane bend is composed of an H-plane bend and a twist. For example, a 90-degree E-plane bend uses a 90-degree H-plane bend and a 90-degree twist. Tallguide straight sections may be fabricated in any length up to 144-inch (3.7-m). When ordering straight sections, the length in inch units are added to the model number as 3 digits. For example, part number 181-0911-076 refers to a TG115 straight section of length 76-inch (1.93-m). Due to inadequate site knowledge, to customer modifications and to system engineering design changes, Tallguide layouts are often not known with any great precision. To accommodate design uncertainty and still meet scheduled deployment, some straight sections may be ordered with a "to be determined" (TBD) length. AFC will prepare the TBD straight section for immediate fabrication for any length up to 144-inch (3.7-m). A TBD straight section is ordered by attaching the letters TBD to the part number. For example, part number 181-0911-TBD refers to a TG115 straight section of length "to be determined." Tallguide flanges are high precision gasket grooved flanges. Tallguide components are shipped with Tallguide pressure gaskets and hardware. Keep track of Tallguide component lengths for the transition, mode suppressor, H-plane bend and twists. Because of these components physical length, straight section lengths must be modified to accommodate such components. Like waveguide, the flange height and width determine the Tallguide cross-section. Cross-section is important when placing Tallguide into a plastic pipe or carrier. AFC supplies both rigid and sliding hanger for many Tallguide bands. Hangers are usually spaced every 5-ft (1524-mm). Tallguide installs like ordinary waveguide. No special tools or alignments are necessary. The electric field of waveguide is straight and parallel to the narrow waveguide wall. In contrast, the electric field of Tallguide is parallel to the broad Tallguide wall. The name, Tallguide, is derived from the "tall" appearance of the Tallguide rectangular shape in comparison to waveguide. Note that the Tallguide cross-section is larger than waveguide. AFC manufactures, markets and sells worldwide satellite dish antennas, radomes, antenna feeds, microwave and waveguide components and ultra low loss waveguide transmission line Tallguide. Our customers serve the broadcast, communications, radar, weather and cable industry, defense, government, and government agencies worldwide. AFC's quality control manufacturing standards are certified under ISO 9001 : 2015.